All junior group tennis coaching is a course which lasts for one half term. Rackets can be provided if needed. Classes introduce 4-8 year olds to tennis. The session will develop a young player’s agility, balance, co-ordination and racket skills. The emphasis is very much on learning the game and having lots of fun! Children play with a sponge ball on a 1/4 length court with mini rackets. Come down on Monday at 4pm or Saturday 9am. Classes are designed for children around the age of 9 years. The session will develop a young player’s agility, balance, co-ordination and racket skills. The emphasis is very much on learning the game and having lots of fun! Children play with transition tennis balls on a 3/4 length court. Come down on Monday at 5pm, Wednesday at 5pm or Saturday at 10am. 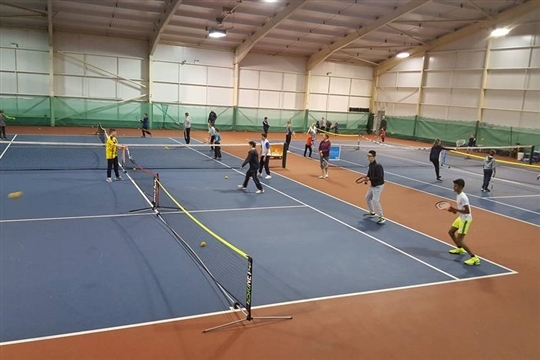 Classes are designed for children around the age of 10 years who want to develop their tennis skills by taking part in drills, learning technique and enjoying various games.. Children play with transition tennis balls on a standard tennis court. Come down on Monday at 5pm or Saturday at 11am. For players aged 11 years & older who want to develop their tennis skills by taking part in drills, learning technique and enjoying various games. Come down on Friday at 5pm or Saturday at Noon. For the more experienced players aged 11 years and upwards who are competing in local competitions. Sessions are 90 minutes in duration and take place on Tuesday at 5.30pm and Thursday at 4.30pm. Please book via the online system.